The change in the four seasons can prompt changes in us as human beings and the world around us. For Milan Butler, the change in the seasons meant her days of juggling books and late-night studying concluded and she would graduate from law school. Following in her Mother’s footsteps, Milan pushed her dreams of becoming a psychologist aside and picked up the gavel. Needing to release the frustration of not having the courage to take control over her life, she seeks comfort in the arms of not one but two men. Open the dictionary and look up loyalty and sacrifice. There, you will find a picture of Hendrix Gordon. Owning one of the largest paper and printing outsourcing companies in South Florida, Hendrix and his family lived a life of many luxuries. A late night of celebration caused Hendrix to make a decision that would later shift his entire empire. After spending seven years in prison for taking the rap for a loved one, Hendrix is a free man with one goal – take back everything snatched from him. After crossing paths with Milan, Hendrix knew from the moment her brown eyes lit up from seeing his drawing that she was the one for him, but when is love ever that easy? 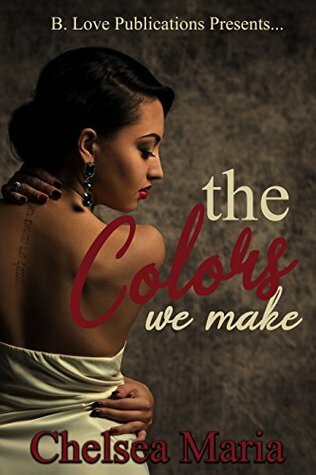 Giving into the desires of her heart, Milan takes a chance on Hendrix and soon realizes that the colors he painted on paper matched the array of colors he brought into her life. Will the colors they create together brush into a portrait worth hanging, or will the oil and water of their structure not mix and cause their colors to run dry? Their love was intense, almost to the point of stopping. I wasn't quite prepared for the Godly, intense love that would find Milan and Hendrix together. Milan lives the life her parents have created for her. College, law school, work with her Mother. It's all set up, and Milan hates it. She's sleeping with her professor and only dreams of helping others. Hendrix just did a seven-year bid. He's just trying to put everything behind him--and move forward. In his process of moving forward--and hoping to shorten his probation period--he signs up to meet with a psychologist--and that psychologist is Milan. In their first meeting, they know--that they are one for the other--and the trip it takes to get there, is fiery, fast--and earth-shattering. Milan was something else. I was afraid her familial obligations--and her fear of all things that Hendrix was providing would destroy the love they were creating. But, no Hendrix--being the bomb man he is--stood firm and solid while she was wavering. AND if that is not a man of God, I don't know what it is. I really enjoyed Hendrix's dedication to his family--his goals in life--and later Milan. His love for her was almost otherworldly. I could only hope to be loved like this in my life. It was incredibly intense, patient--and at times I just didn't understand it. But, he loved her enough--until she was able to fully love and appreciate him, and then herself. As for a plot, there's no absolute conclusive place that the book needed to get to. But the ending was satisfying--and complete for their story. The writing was decent. The characters were solid and convincing. Readers will honestly enjoy, going on this love journey with Hendrix and Milan. I know I did. I'm intrigued to see more of what this author has to offer. Recommended! Sometimes a love story is just a love story right? Glad this was good even if it wasn't exactly perfect.